See video and hear sound from the vehicle as you drive! 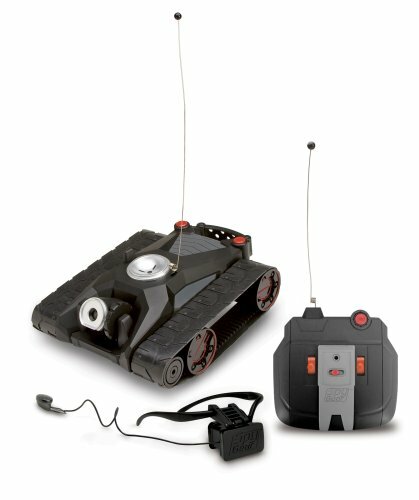 This full-function, dual-track radio controlled ATV has off-road power and a 360-degree view button on remote, plus a headset, LCD viewing screen and earbuds for listening. Requires 12 "AA" batteries, not included. Hours of fun--a definite hit! One of my sons was absolutely delighted when he found this item on clearance at a local retailer. Since he bought it, he uses it every day. Suprisingly, too, it has not burned through batteries as quickly as I imagined it would. The treads allow it to navigate more areas than a wheeled audio-receiver car he got at Christmas. He can drive over small piles of laundry and even Matchbox cars--something important since he can only see based on the angle at which the camera is set before it is set in motion. He's been driving it around the house and spying on his brother's Cub Scout meetings and his sister's Brownie meetings. He's had it outside and inside. It's the most pleased he's ever been with a toy. My 7 year old son bought this with his Christmas money. For a toy, it is money well spent. He is enjoying many hours of fun with this toy, steering it all over the house and sidewalk from remote areas of the house. I tried the eyepiece on and the video quality is quite good but definitely like tunnel vision. The camera cannot be remotely controlled up and down. That must be done manually. There is a 360 degree button that spins the ATV around when I want to see where I am. The volume in the earpiece can be adjusted remotely. There is one earbud and the manual instructs us not to substitute other earbuds or headphones or risk damaging the controller. The sound quality is great but it turns off when the vehicle is in motion, so I can only listen when the vehicle is stopped. Battery life has been decent considering how much my son plays with it. I needed 12 AA batteries to get it running and the manual advises us not to use rechargeable batteries. I wish I knew why because this is the second spy toy we have that says that. My son has spent hours with this tank. His friends also envy the x-mas present. It takes a lot of batteries (6x2) but seems to last for a long time before batteries need replaced. Years ago I had a vision for a toy like this. I bought one for my child (a tween) and I sometimes get to play with it. It does what it says. The audio is muted while the toy is moving. This is not a big deal, I mean do you really want to hear the thing making all the noise while it is moving. The other thing is that the camera is stationary. You can manually move it but not by the remote control. Again, not a big deal. this toy was supercool for a couple of go-s.
After a couple of weeks, it won't turn properly.